If you're looking for an accessible practice-based book to improve your playing, you've come to the right place. Mandolin Exercises For Dummies focuses on the skills that players often find challenging and provides tips, tricks and plenty of cool exercises that will have you picking with the best of them—or at least much better than before! 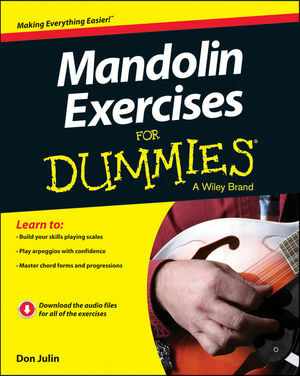 Mandolin Exercises For Dummies is packed with instruction—from hundreds of exercises to drills and practice pieces. And it gets better. You'll also have online access to downloadable audio files for each exercise, making this practice-based package a complete mandolin companion. Master the basics and sharpen your mandolin-playing skills with this reliable resource. Don Julin is professional mandolin player, instructor and recording artist. Don has spent the last 30 years challenging the boundaries of mandolin and helping others do the same. He is the author of Mandolin For Dummies®.